Hi, guys! How to strengthen my diaphragm? By word "strengthen" I mean to make it work longer, increase breath control. It's something that comes if you just using it while singing, or there is some exercises? Personally, I turn on the video where Ken sings "Numb" by Linkin Park and try to sing chorus with him in one breath. I'll be honest: I barely can finish the chorus with one inhale, but Ken actually goes really longer. I tried to squeeze my diaphragm from the up and down, tried to take a bigger breath, tried to hold my breath while singing, but I just can't do it longer than that. From this I can conclude that my diaphragm is pretty weak right now. 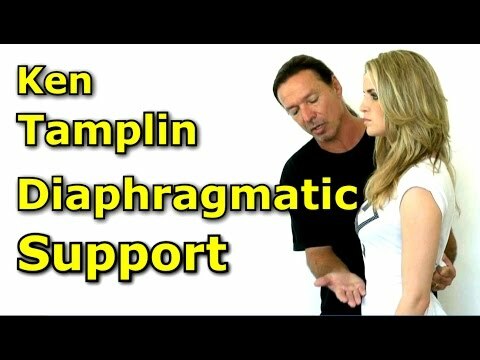 The only thing I can recommend in the general singing area is to refer you to Ken's videos on Diaphragmatic Breath Control that he has on youtube. It's a matter of stamina. Ken's program builds this in you over a period of months and years, by exercising on his workouts and following his lesson instructions. There is no one, simple thing that is going to produce the diaphragmatic strength you need. It's the combination of doing Ken's workouts, as he teaches, throughout his program. You learn these techniques little-by-little, day-by-day, through Ken's program. Ken has a very good video on this topic on youtube for free. Listen closely and do the exercises. The videos covers really a lot on that. @videoace @doc_ramadani thank you guys! I'll refer to that video! @highmtn thank you! So I need just working on it and it will get stronger with time? @Whitesnake: yes, absolutely, be patient. Spend your time on the exercises.